TempElertUSB is ready to run on any Windows based PC with Windows XP/Vista (32 bit only), Server2003/2008, and Windows 7/8 (32/64 bit). Legacy downloads are available for Windows 2000 but are not officially supported. See our support page. Works with USB 1.1 and 2.0 ports, self powered. Setup time is usually 1 minute or less. Comes with USB sensor, CD ROM, printed quick start guide. Manual (PDF) is on CD and within the software application. 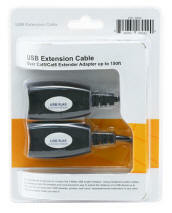 Our USB over Cat5e/6 Extender eliminates the range limit obstacle by allow you to extend USB connection over an astounding 150ft by using cheap, economical Cat5e/6 cables. This can be especially convenient if you already have unused Ethernet cabling pre-installed in your walls. Installation is simple. Just connect one piece to your computer or powered USB hub, the other piece to your TempElertUSB sensor and connect a Ethernet patch cable in between. The device is self powered so there's no need to connect any power adapters. For best performance on longer distances it is recommended to use shielded Cat6 cables. 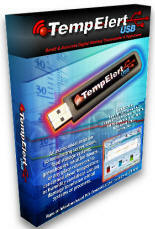 • Extends the distance of a TempElertUSB sensor from a USB-enabled computer up to 150ft. • Self-powered so no external power source is required. • Uses standard Cat5/Cat5E/Cat6 cable (not included). 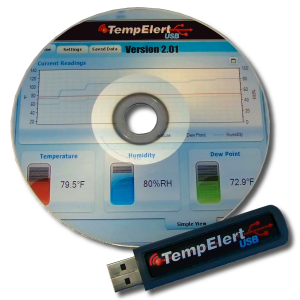 Terms: Price FOB Chico, CA Delivery of TempElertUSB is typically from stock. Most orders ship the same day if ordered by 2PM PST. Expedited shipping options are available.